This is a Chinese name; the family name is Huo. Huo Qubing (140 BC – 117 BC) was a distinguished military general of the Western Han dynasty during the reign of Emperor Wu of Han. He was the nephew of the general Wei Qing and Empress Wei Zifu (Emperor Wu's wife), and the half-brother of the statesman Huo Guang. Along with Wei Qing, he led a campaign into the Gobi Desert of what is now Mongolia to defeat the Xiongnu nomadic confederation, winning decisive victories such as the Battle of Mobei in 119 BC. Wei Qing, courtesy name Zhongqing, born Zheng Qing in Linfen, Shanxi, was a military general and consort kin of the Western Han dynasty whose campaigns against the Xiongnu earned him great acclaim. He was a relative of Emperor Wu of Han because he was the younger half-brother of Empress Wei Zifu and the husband of Princess Pingyang. He was also the uncle of Huo Qubing, another notable Han general who participated in the campaigns against the Xiongnu. Huo Guang, courtesy name Zimeng (子孟), was a Western Han politician who was a rare example in Chinese history of a powerful official who deposed an emperor for the good of the state rather than to usurp the throne. He was the half-brother of renowned Han general Huo Qubing, and one of the most powerful consort kin in Chinese imperial history. Huo Qubing was an illegitimate son from the premarital affair between Wei Shaoer (衛少兒), daughter of a lowly maid from the household of Princess Pingyang, and Huo Zhongru (霍仲孺), a low-class civil servant who were employed there also at the time. However, Huo Zhongru did not want to marry a girl from a lower class background, so he abandoned Wei Shaoer and went back to his home town to marry a local woman instead. Wei Shaoer insisted on keeping the child, raising him with help of her siblings. When Huo Qubing was around two years old, his aunt, Wei Zifu, who was the younger sister of Wei Shaoer, was serving as an in-house singer/dancer for Princess Pingyang, when she caught the attention of the young Emperor Wu, who took her and her half-brother, Wei Qing, back to his palace in the capital, Chang'an. More than a year later, the newly favoured concubine Wei Zifu became pregnant with Emperor Wu's first child, earning her the jealousy and hatred of Emperor Wu's then formal wife, Empress Chen. Empress Chen's mother, Eldest Princess Guantao (館陶長公主), then attempted to retaliate against Wei Zifu by kidnapping and attempting to murder Wei Qing, who was then serving with the cavalry at the Jianzhang Camp (建章營, Emperor Wu's royal guards). After Wei Qing was rescued by his fellow palace guards led by his close friend, Gongsun Ao (公孫敖), Emperor Wu took the opportunity to humiliate Empress Chen and Princess Guantao, by promoting Wei Zifu to a consort (夫人, a concubine position lower only to the Empress) and Wei Qing to the triple role of Chief of Jianzhang Camp (建章監), Chief of Staff (侍中), and Chief Councillor (太中大夫), effectively making him one of Emperor Wu's closest lieutenants. The rest of the Wei family were also well rewarded, including the decreed marriage of Wei Shaoer's older sister Wei Junru (衛君孺) to Emperor Wu's adviser, Gongsun He (公孫賀). At the time, Wei Shaoer was romantically engaged with Chen Zhang (陳掌), a great-grandson of Emperor Gaozu's adviser Chen Ping. Their relationship was also legitimized by Emperor Wu through the form of decreed marriage. Through the rise of the Wei family, the young Huo Qubing grew up in prosperity and prestige. Wei Zifu, posthumously known as Empress Xiaowu Si (孝武思皇后) or Wei Si Hou, was an empress during ancient China's Han dynasty. She was the second wife of the famous Emperor Wu and his spouse of 49 years, and stayed as his empress for 38 years, the second longest in Chinese history. She was the mother of Emperor Wu's heir apparent, Liu Ju, as well as the older half-sister of the famed general Wei Qing, the younger aunt of Huo Qubing, the step-aunt of Han statesman Huo Guang and the great-grandmother of Liu Bingyi. Chang'an was an ancient capital of more than ten dynasties in Chinese history, today known as Xi'an. Chang'an means "Perpetual Peace" in Classical Chinese since it was a capital that was repeatedly used by new Chinese rulers. During the short-lived Xin dynasty, the city was renamed "Constant Peace" ; the old name was later restored. By the time of the Ming dynasty, a new walled city named Xi'an, meaning "Western Peace", was built at the Sui and Tang dynasty city's site, which has remained its name to the present day. A royal guard describes any group of military bodyguards, soldiers or armed retainers responsible for the protection of a royal person, such as the emperor or empress, king or queen, or prince or princess. They often are an elite unit of the regular armed forces, or are designated as such, and may maintain special rights or privileges. Huo Qubing exhibited outstanding military talent even as a teenager. Emperor Wu saw Huo's potential and made Huo his personal assistant. The vanguard is the leading part of an advancing military formation. It has a number of functions, including seeking out the enemy and securing ground in advance of the main force. Su Wu was a Chinese diplomat and statesman of the Han Dynasty. He is known in Chinese history for making the best of his mission into foreign territory. During his mission he was captured and then detained for nineteen years, enduring major hardship at least in the early years of his captivity. Nevertheless, he endured this treatment while remaining faithful to his mission and his homeland. Zhao Xin, was originally a marquis of Xiongnu heritage, who previously surrendered to the Han Dynasty of China. In 121 BC, Emperor Wu deployed Huo Qubing twice in that year against the Xiongnu in the Hexi Corridor. During spring, Huo Qubing led 10,000 cavalry, fought through five Western Regions kingdoms within 6 days, advanced over 1,000 li over Mount Yanzhi (焉支山), killed two Xiongnu princes along with nearly 9,000 enemy troops, and captured several Xiongnu nobles as well as the golden statue used by Xiongnu as an artifact for holy rituals. For this achievement, his march was increased by 2,200 households. During the summer of the same year, Xiongnu attacked the Dai Commandery and Yanmen. Huo Qubing set off from Longxi (modern-day Gansu) with over 10,000 cavalry, supported by Gongsun Ao, who set off from the Beidi Commandery (北地郡, modern-day Huan County, Gansu). Despite Gongsun Ao failing to keep up, Huo Qubing travelled over 2,000 li without backup, all the way past Juyan Lake to Qilian Mountains, killing over 30,000 Xiongnu soldiers and capturing a dozen Xiongnu princes. His march was then increased further by a 5,400 households for the victory. Hexi Corridor (Chinese: 河西走廊; pinyin: Héxī Zǒuláng; Wade–Giles: Ho2-hsi1 Tsou3-lang2, Xiao'erjing: حْسِ ظِوْلاْ, IPA: /xɤ˧˥ɕi˥ tsoʊ˨˩˦lɑŋ˧˥/) or Gansu Corridor refers to the historical route in Gansu province of China. As part of the Northern Silk Road running northwest from the bank of the Yellow River, it was the most important route from North China to the Tarim Basin and Central Asia for traders and the military. The corridor is a string of oases along the northern edge of the Tibetan Plateau. To the south is the high and desolate Tibetan Plateau and to the north, the Gobi Desert and the grasslands of Outer Mongolia. At the west end the route splits in three, going either north of the Tian Shan or south on either side of the Tarim Basin. At the east end are mountains around Lanzhou before one reaches the Wei River valley and China proper. The Western Regions or Xiyu was a historical name specified in the Chinese chronicles between the 3rd century BC to the 8th century AD that referred to the regions west of Yumen Pass, most often Central Asia or sometimes more specifically the easternmost portion of it, though it was sometimes used more generally to refer to other regions to the west of China as well, such as the Indian subcontinent. A cultural artifact, or cultural artefact, is a term used in the social sciences, particularly anthropology, ethnology and sociology for anything created by humans which gives information about the culture of its creator and users. Artifact is the spelling in North American English; artefact is usually preferred elsewhere. Archeologists, the people who mostly find or describe older artifacts, generally just use the term artifact. Huo Qubing's victories dealt heavy blows to the tribes of the Xiongnu princes of Hunye (渾邪王) and Xiuchu (休屠王) that occupied the Hexi Corridor. Out of frustration, Yizhixie Chanyu wanted to mercilessly execute those two princes as punishment. The Prince of Hunxie contacted the Han government in autumn of 121 BC to negotiate a surrender. Failing to persuade his fellow prince to do the same, he killed the Prince of Xiutu and ordered Xiutu's forces to also surrender. When the two tribes went to meet the Han forces, Xiutu's forces rioted. Seeing the situation changed, Huo Qubing alone headed to the Xiongnu camp. There, the general ordered the Prince of Hunxie to calm his men and stand down before putting down 8,000 Xiongnu men who refused to disarm, effectively quelling the riot. The Hunxie tribe was then resettled into the Central Plain. The surrender of the Xiutu and Hunxie tribes stripped Xiongnu of any control over the Western Regions, depriving them of a large grazing area. As a result, Han Dynasty successfully opened up the Northern Silk Road, allowing direct trade access to Central Asia. This also provided a new supply of high-quality horse breeds from Central Asia, including the famed Ferghana horse (ancestors of the modern Akhal-Teke), further strengthening the Han army. Emperor Wu then reinforced this strategic asset by establishing five commanderies and constructing a length of fortified wall along the border of the Hexi Corridor. He colonised the area with 700,000 Chinese soldier-settlers. A riot is a form of civil disorder commonly characterized by a group lashing out in a violent public disturbance against authority, property or people. 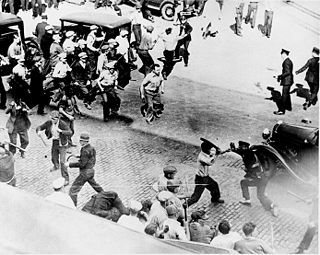 Riots typically involve theft, vandalism, and destruction of property, public or private. The property targeted varies depending on the riot and the inclinations of those involved. Targets can include shops, cars, restaurants, state-owned institutions, and religious buildings. The Northern Silk Road is a prehistoric trackway in northern China originating in the early capital of Xi'an and extending north of the Taklimakan Desert to reach the ancient kingdoms of Parthia, Bactria and eventually Persia and Rome. It is the northern-most branch of several Silk Roads providing trade, military movements and cultural exchange between China and the west. 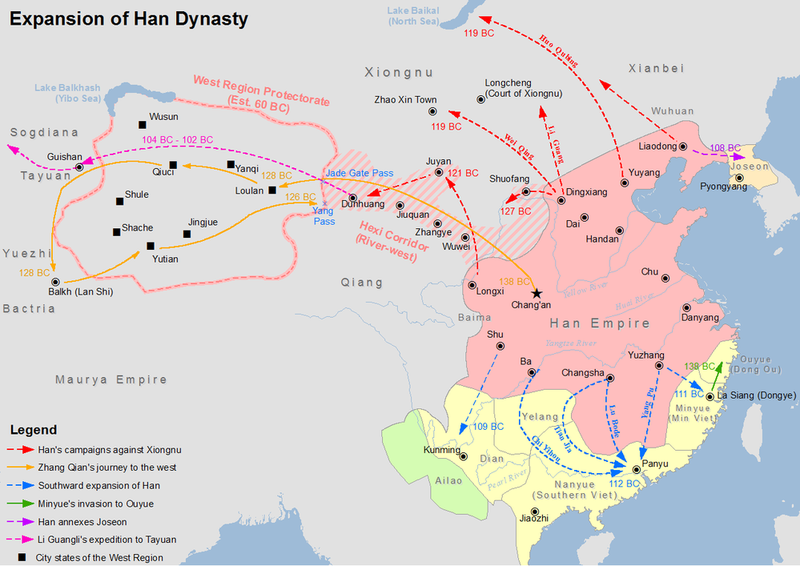 The use of this route was expanded pursuant to actions by the Han dynasty in the latter part of the first millennium BC to push back northern tribes and control the safe passage of Chinese troops and merchants. Ferghana horses were one of China's earliest major imports, originating in an area in Central Asia. These horses, as depicted in Tang dynasty tomb figures in earthenware, "resemble the animals on the golden medal of Eucratides, King of Bactria ." After the series of defeats by Wei Qing and Huo Qubing, Yizhixie Chanyu took Zhao Xin's advice and retreated with his tribes to the north of the Gobi Desert, hoping that the barren land would serve as a natural barrier against Han offensives. Emperor Wu however, was far from giving up, and planned a massive expeditionary campaign in 119 BC. Han forces were deployed in two separate columns, each consisting of 50,000 cavalry and over 100,000 infantry, with Wei Qing and Huo Qubing serving as the supreme commander for each. Emperor Wu, who had been distancing Wei Qing and giving the younger Huo Qubing more attention and favour, hoped that Huo would engage the stronger Chanyu's tribe and preferentially assigned him the most elite troopers. The initial plan called for Huo Qubing to attack from Dingxiang (定襄, modern-day Qingshuihe County, Inner Mongolia) and engage the Chanyu, with Wei Qing supporting him in the east from Dai Commandery (代郡, modern-day, Yu County, Hebei) to engage the Left Worthy Prince (左賢王). However, a Xiongnu prisoner of war confessed that the Chanyu's main force was at the east side. Unaware that this was actually false information provided by the Xiongnu, Emperor Wu ordered the two columns to switch routes, with Wei Qing now setting off on the western side from Dingxiang, and Huo Qubing marching on the eastern side from the Dai Commandery. When it came to military glory, Huo Qubing was said to be more generous. One story about him told of when Emperor Wu awarded Huo a jar of precious wine for his achievement, he poured it into a creek so all his men drinking the water could share a taste of it, giving the name to the city of Jiuquan (酒泉, literally "wine spring"). Huo Qubing died in 117 BC at the early age of 24. After Huo Qubing's death, the aggrieved Emperor Wu ordered the elite troops from the five border commanderies to line up all the way from Chang'an to Maoling, where Huo Qubing's tomb was constructed in the shape of the Qilian Mountains to commemorate his military achievements. Huo Qubing was then posthumously appointed the title Marquess of Jinghuan (景桓侯),  and a large "Horse Stomping Xiongnu" (馬踏匈奴) stone statue was built in front of his tomb,  near Emperor Wu's tomb of Maoling. The Champion of Piaoji, fast and brave. Six long-distance assaults, like lightning and thunder. Watering horse at Lake Baikal, conducting rituals at Khentii Mountains. Conquering the area west of great river, establishing commanderies along Qilian Mountains. Huo Qubing's half-brother, Huo Guang, whom he took custody away from his father, was later a great statesman who was the chief counsel for Emperor Zhao, and was instrumental in the succession of Emperor Xuan to the throne after Emperor Zhao's death. Huo Qubing's son, Huo Shàn (霍嬗), succeeded him as the Marquess of Jinghuan but died young in 110 BC. So Huo Qubing's title became extinct. His grandson Huo Shān (霍山, later Marquess of Leping) and Huo Yun (霍云, later Marquess of Guanyang) were involved in a failed plot to overthrow Emperor Xuan of Han in 66 BC, resulting in both of them committing suicide and the Huo clan being executed. It was presumably that no male descendant of Huo Qubing nor Huo Guang survived, as during the reign of Emperor Ping of Han, it was Huo Yang, a great-grandson of Huo Qubing's paternal cousin, who chosen as the descendent of Huo Guang to be the Marquess of Bolu. Huo Qubing is one of the 32 historical figures who appear as special characters in the video game Romance of the Three Kingdoms XI by Koei. Huo Qubing was played by Li Junfeng (李俊锋) in the popular 2005 historical epics TV series The Emperor in Han Dynasty (汉武大帝). Huo Qubing was played by Eddie Peng (彭于晏) under the name of Wei Wuji （卫无忌）in the popular romance Chinese drama Sound of the Desert (风中奇缘） derived from the book Da Mo Yao/Ballad of the Desert (大漠谣) by famous novel writer Tong Hua. ↑ Grousset, Rene (1970). The Empire of the Steppes. Rutgers University Press. p. 35. ISBN 0-8135-1304-9. Deng Ai, courtesy name Shizai, was a military general of the state of Wei during the Three Kingdoms period of China. He is best known for his pivotal role in the Wei conquest of its rival state, Shu, in 263. He was described as a very loyal subject who made great contributions to Wei, but was also noted for his arrogance and audacity, which led to his downfall and death. Zhuge Liang's Northern Expeditions were a series of five military campaigns launched by the state of Shu Han against the rival state of Cao Wei from 228 to 234 during the Three Kingdoms period in China. All five expeditions were led by Zhuge Liang, the Imperial Chancellor and regent of Shu. Although they proved unsuccessful and ended up as a stalemate, the expeditions have become some of the best known conflicts of the Three Kingdoms period and one of the few battles during it where each side fought against each other with hundreds of thousands of troops, as opposed to other battles where one side had a huge numerical advantage. Cao Zhen, courtesy name Zidan, was a military general of the state of Cao Wei during the Three Kingdoms period of China. He was an adopted son of Cao Cao, a warlord who rose to power in the late Eastern Han dynasty and laid the foundation for Wei. After Cao Cao's death and the end of the Eastern Han dynasty, Cao Zhen served under Cao Pi and Cao Rui, the first two emperors of Wei. He is best known for leading a successful defence of Wei from the first two of a series of invasions by Wei's rival state, Shu Han, between 228 and 229. Jia Xu, courtesy name Wenhe, was an official of the state of Cao Wei during the early Three Kingdoms period of China. He started his career in the late Eastern Han dynasty as a minor official. In 189, when the warlord Dong Zhuo took control of the Han central government, he assigned Jia Xu to the unit led by Niu Fu, his son-in-law. In 192, after Dong Zhuo was assassinated by Lü Bu, Jia Xu advised Li Jue, Guo Si and Dong Zhuo's loyalists to fight back and seize control of the imperial capital, Chang'an, from a new central government headed by Lü Bu and Wang Yun. After Li Jue and the others defeated Lü Bu and occupied Chang'an, Jia Xu served under the central government led by them. During this time, he ensured the safety of the figurehead Han emperor, Emperor Xian, who was being held hostage by Li Jue. He also attempted to prevent internal conflict between Li Jue and Guo Si, but with limited success. After Emperor Xian escaped from Chang'an, Jia Xu left Li Jue and briefly joined the general Duan Wei before becoming a strategist of the warlord Zhang Xiu. While serving under Zhang Xiu, he advised his lord on how to counter invasions by the warlord Cao Cao, who had received Emperor Xian in 196 and taken control of the central government. In 200, during the Battle of Guandu between Cao Cao and his rival Yuan Shao, Jia Xu urged Zhang Xiu to reject Yuan Shao's offer to form an alliance and instead surrender to Cao Cao. Zhang Xiu heeded his advice. Jia Xu then became one of Cao Cao's strategists. Xiahou Shang, courtesy name Boren, was a military general of the state of Cao Wei during the Three Kingdoms period of China. He was a distant younger relative of Xiahou Yuan and a close friend of Cao Pi, the first emperor of the Cao Wei state. Wu Ban, courtesy name Yuanxiong, was a military general of the state of Shu Han in the Three Kingdoms period of China. Quan Cong, courtesy name Zihuang, was a military general of the state of Eastern Wu during the Three Kingdoms period of China. Born in present-day Hangzhou towards the end of the Eastern Han dynasty, Quan Cong became famous at a young age when he performed acts of charity by giving grain to people suffering from famine and providing shelter to refugees from central China. He started his career under the warlord Sun Quan as a military officer and achieved success in his early career by pacifying the restive Shanyue tribes in the Jiangdong territories. After Sun Quan became an independent ruler of Wu in 222, Quan Cong rose to the rank of General and participated in battles against Wu's rival state Wei. He also pacified rebellions by local tribes in Danyang, Wu and Kuaiji commanderies. After Sun Quan became emperor in 229, Quan Cong married his daughter Sun Luban and became one of his most trusted generals. During this time, although he was less active in battles, he became more outspoken on state affairs. He strongly objected to Sun Quan's decision to let his heir apparent Sun Deng lead troops into battle because it was against traditions, and attempted to dissuade Sun Quan from launching an invasion of Zhuya and Yizhou. Towards the end of his life, he became embroiled in a power struggle between Sun Quan's sons Sun He and Sun Ba over the succession to their father's throne. Although he supported Sun Ba, he died before he could see the power struggle end in 250 with neither Sun He nor Sun Ba becoming the new heir apparent. Throughout his life, Quan Cong was known for being a respectful and agreeable man who remained humble despite his high social status and prestige. As a military commander, he was known for being courageous and decisive, and for conducting himself with dignity and often taking the bigger picture into consideration. Huan Jie, courtesy name Boxu, was a Chinese official who lived during the late Eastern Han dynasty and served under the warlord Cao Cao. After the fall of the Eastern Han dynasty, he briefly served in the state of Cao Wei during the Three Kingdoms period. Luo Xian, courtesy name Lingze, was a military general of the Jin dynasty of China. He previously served in the state of Shu during the Three Kingdoms period. He is best known for defending his position at Yong'an for about six months against attacks from Shu's former ally state Wu after the fall of Shu. Huo Yi, courtesy name Shaoxian, was a military general of the state of Shu Han in the Three Kingdoms period of China. His father, Huo Jun, served under Liu Bei, the founding emperor of Shu. During his service under the Shu emperor Liu Shan, Huo Yi suppressed tribal rebellions in the restive Nanzhong region and maintained peace in the area. After Shu was conquered by its rival state Cao Wei in 263, Huo Yi surrendered to the Wei regime and was permitted to remain in charge of keeping the peace in Nanzhong. In return, Huo Yi became a Wei subject and presumably continued serving under the Jin dynasty, which replaced the Wei regime in 265. Wang Ji, courtesy name Boyu, was a military general of the state of Cao Wei during the Three Kingdoms period of China. He started his career as a low-ranking official under Wang Ling, the governor of Qing Province. During this time, he was noted for exemplary performance and was later transferred to the central government in Luoyang. He was subsequently promoted to the position of a commandery administrator, but was briefly removed from office when the Wei regent Sima Yi ousted his co-regent Cao Shuang in a coup d'état in 249. However, he was quickly recalled to government service, promoted to the position of governor of Jing Province and appointed as a military general. From 251 until his death in 261, Wang Ji maintained close but professional working relationships with the Wei regents Sima Shi and Sima Zhao. During this time, he supervised military operations in Jing, Yu and Yang provinces, and defended Wei's eastern and southern borders against attacks by Wei's rival state, Eastern Wu. He also assisted Sima Shi and Sima Zhao in suppressing two of the three Shouchun rebellions in 255 and 257–258 respectively. In 261, in the months just before his death, he correctly pointed out that two Eastern Wu military officers were pretending to defect to Wei, and managed to stop the Wei forces from falling into a trap. Zong Yu, courtesy name Deyan, was a military general and diplomat of the state of Shu Han during the Three Kingdoms period of China. The Battle of Dongxing, also known as the Battle of Dongguan, was fought from January to February 253 between the states of Cao Wei and Eastern Wu during the Three Kingdoms period of China. The battle concluded with a tactical victory for Wu. Yu Si, courtesy name Shihong, was an official of the state of Eastern Wu during the Three Kingdoms period of China. The Eastern Wu campaign against Cao Wei was a military offensive launched in 241 by the state of Eastern Wu against its rival state, Cao Wei, during the Three Kingdoms period of China. The campaign was initiated by Wu's founding emperor, Sun Quan, two years after the death of the second Wei emperor, Cao Rui. The campaign ended with an overall failure. Princess Jieyou, born Liu Jieyou, was a Chinese princess sent to marry the leader of the Wusun kingdom as part of the Western Han Chinese policy of heqin. As the granddaughter of the disgraced Prince Liu Wu (劉戊) who had taken part in the disastrous Rebellion of the Seven States, her status was low enough that she was sent to replace Princess Liu Xijun (劉細君) after her untimely death and marry the Wusun king Cunzhou (岑陬). After his death, she married his cousin and successor, Wengguimi (翁歸靡), to whom she bore five children including Yuanguimi (元貴靡). Zhou Tai was a military general who served in the state of Cao Wei during the Three Kingdoms period of China. Hu Zong (183–243), courtesy name Weize, was a government official, writer, poet and military general of the state of Eastern Wu in the Three Kingdoms period of China.